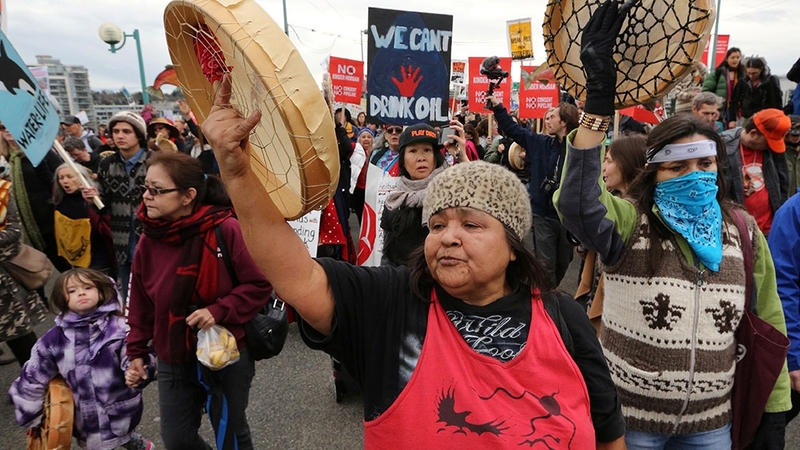 Montreal, Canada – A Canadian federal court has quashed government permits to expand the Trans Mountain pipeline, a decision that has been welcomed by Indigenous leaders and puts the future of the contentious $5bn project in limbo. In a ruling issued on Thursday morning, the Federal Court of Appeal said the National Energy Board of Canada (NEB) made a “critical error” in issuing a report the federal government relied on to give the project the green light in 2016. The court said the NEB – an independent regulatory body that oversees permits for oil and gas projects – did not take into account an increase in tanker traffic off the coast of British Columbia as a result of the pipeline’s expansion. Its report to the government failed to give Ottawa the information “it needed in order to properly assess the public interest, including the project’s environmental effects – matters it was legally obligated to assess,” the ruling states. Prime Minister Justin Trudeau approved the project in November 2016, saying that it would bolster the Canadian economy and create jobs, and that it is in Canada’s national interest to get it built. The Trans Mountain project involves twinning an existing 1,150km pipeline to ship up to 890,000 barrels of oil every day from the Alberta tar sands to Canada‘s west coast, for export overseas. In its decision, the court also said the federal government failed to meet the minimum standard required in its consultations with Indigenous people. Under the Constitution, Canada has a “duty to consult” and accommodate Indigenous people when a project may impact their Aboriginal or treaty rights. The Duty to Consult has been a constitutional obligation for the Crown for over a decade and is still routinely neglected, fumbled and outsourced to Crown-like agencies for rubber-stamp approval. As was the case in Tsleil-Waututh Nation et al. v. Attorney General of Canada. The government did not engage in “responsive, considered and meaningful dialogue” with the Indigenous applicants in the case, which included the Tsleil-Waututh Nation, the Squamish Nation, and the Coldwater Indian Band, among others. “The law requires Canada to do more than receive and record concerns and complaints,” the court said. Indigenous leaders across Canada welcomed the court’s decision. They have long argued they weren’t adequately consulted, and never gave their consent on the pipeline as well. “It’s a great day today. We won!” said Chief Lee Spahan, of the Coldwater Indian Band, at a press conference in Vancouver. “Right from the beginning, we always said water is life. Water is sacred. They can say they consulted, but they never, ever, ever got our consent,” he added. Chief Bob Chamberlin, vice-president of the Union of British Columbia Indian Chiefs (UBCIC), said the ruling is “a major win with impacts that will be felt across the country”. “The project should never have been approved, and we are greatly encouraged that the Federal Court of Appeal has recognised the need for Canada to uphold Indigenous Title and Rights on projects on their territories, and fulfil their commitments to true reconciliation,” Chamberlin said in a statement. Bill Morneau, Canada’s finance minister, said the government is reviewing the court’s decision carefully, but it has not yet decided what its exact response will be. “We’re going to review today’s decision to ensure that we’re meeting high standards when it comes to both protecting the environment and meeting our obligations to consult with Indigenous peoples,” Morneau said during a news conference. 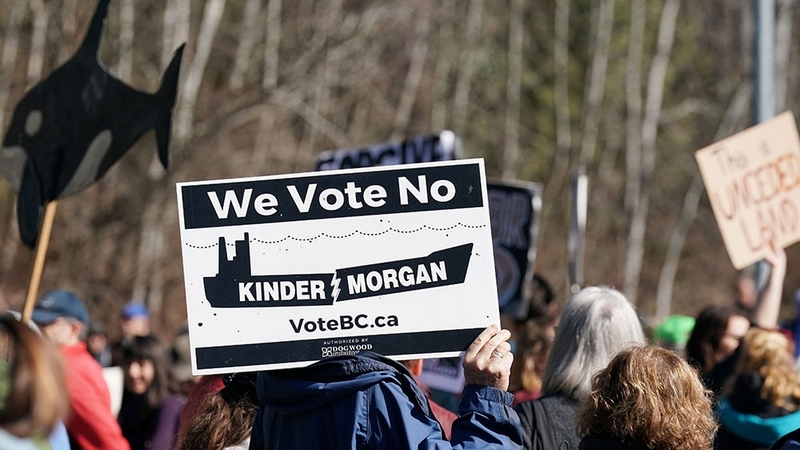 Also on Thursday, the shareholders of Kinder Morgan, the company responsible for Trans Mountain, voted overwhelming in favour of selling the pipeline to the Canadian government. In late May, Canada announced it would spend $3.5bn to buy the pipeline from Kinder Morgan, in essence nationalising the project. Morneau said the government expects to close on the acquisition of the project as early as Friday. In its ruling, the court instructed Ottawa to remedy the two problems its decision was based on – including restarting the consultation process with Indigenous people – and come to a “fresh decision”. “This is a project that’s in Canada’s national interest, a project that means thousands of good, well-paying jobs for the middle-class, that will help us to get a fair price for Canadian resources,” he said. But the government still faces an uphill battle, as Indigenous leaders, environmental groups, and several municipalities in BC have vowed they won’t allow the project to be built. Mike Hudema, a spokesperson for Greenpeace Canada, said Justin Trudeau should “read the writing on the wall”. “Dump this pipeline and shift the billions of public dollars slated for this problem-plagued project into Canada’s renewable energy economy,” Hudema said in a statement.